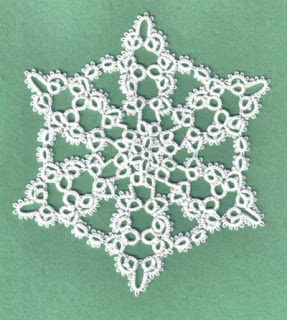 This is another of the same type of snowflake which can be used as is or have a one inch bead added to the centre. You'll see the beaded version in the composite picture posted a few days ago. This is the snowflake I showed earlier but this time it's been blocked and it doesn't look like the design needs to be modified. Both of your snowflakes are great! OMGosh! They are both spectacular snowflakes! DROOL...DrOoL...drool!!! Pardon my drooling please! They are absolutely gorgeous and I am sure hoping that the patterns gets shared one of these days! Hope...hope...hope! Both are fantabulous. They look delicate and lacy while still being sturdy enough to hold their own hanging on a tree or in a window. Wonderful. About your earlier question -- yes! 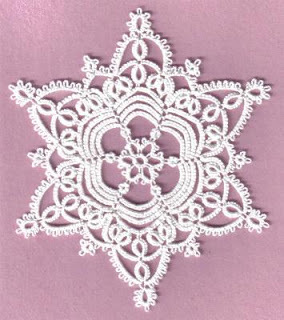 the tatting world *does* need another snowflake pattern book! Están preciosos los copos de nieve..... ¿No se cual me gusta más? They are lovely snowflakes ..... Does not that I like best?